What is the food that you have the most fun eating? 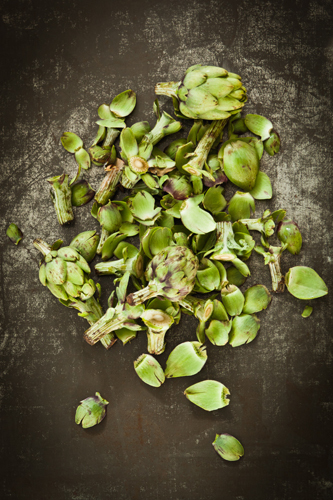 Watermelon comes to mind, so does cotton candy, but at our house, our favorite is artichokes. They are wonderfully messy and a good excuse to dip into warm butter with lemon or perhaps this recipe. We don’t need much of a nudge to do this. We love their fresh, clean taste. Something about plucking the leaves off, dipping them into sauce and getting their meaty goodness by scraping them between your teeth appeals to us. It’s tasty, fun, easy and casual. We don’t need much of a nudge to do this, just their appearance in the spring. If you haven’t tried them because they seem like too much work…..think again. At our house, we don’t do anything but trim the ends and outer leaves and simmer covered till the leaves easily pull away from the core. No special trimming, no coring….we just stop when we get to the choke….not as beautiful, but very easy. Hope your tempted to try them as an appetizer for your Sunday supper this week. Pour olive oil into a small bowl. Using a garlic press, press the garlic into the bowl and let it sit for 10 minutes. Using a strainer, strain the garlic from the olive oil. Into olive oil, whisk fresh lemon juice, grated parmesan cheese, salt and pepper. 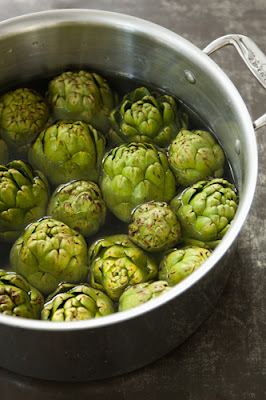 Serve with warm artichokes. Savory Pumpkin Apple Soup Recipe – Greetings Australia! 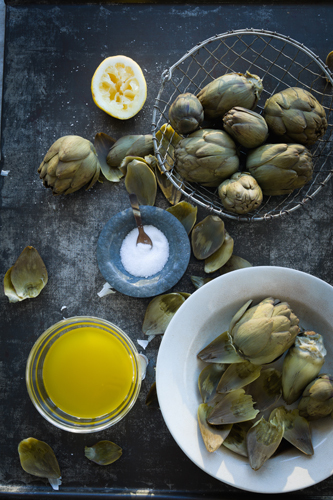 Susie, this recipe is just perfect timing for me, I just bought artichokes wondering how to prepare them :) Thank you for the recipe! Have a great weekend!